The Church is a people, and is a ministry of the people of God. We encourage all to serve in the ECC community according to their gifts and passions. Some Sunday morning ministries are these: Set-up team; altar guild; lay reader; prayer leader; chalicer; teller; refreshment provider; bread provider; audio and technology support. But there are many ways to serve with Church of the Cross outside Sunday morning. So we invite you to consider the passions and gifts God has given you, and to come along to help our common life be possible. 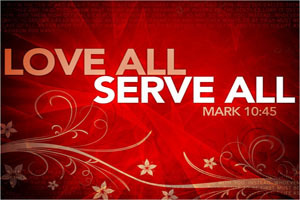 Jesus came not to be served, but to serve (Mark 10:45). 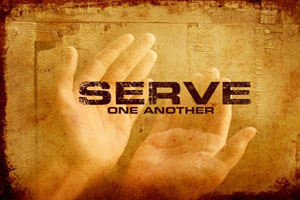 As followers of Christ, Church of the Cross also seek to be servants in the world. The people of Church of the Cross serve their communities in many ways: in scouting, education, health care, and fund-raising—to name just a few--and in their daily ministry at home and at work. We invite you to come along, and be a blessing to our neighborhoods and communities. Mobile Loaves and Fishes: Church of the Cross serves with Mobile Loaves and Fishes the first and third Tuesday of every month. On the first and third Tuesdays we take out a truck to deliver food and clothing to an Austin area community that would welcome a bit of fellowship and grace. On the third Tuesday, we also prepare the truck to go out by making meals and loading them on the truck. Please click here for more information on Mobile Loaves and Fishes. Partners in Hope: Church of the Cross regularly serves with Partners in Hope, a local ministry that does restorative reconstruction on homes in the Lake Travis community. Please click here for more information on Partners in Hope. Giving Sundays: Once every ten weeks, the complete Sunday offering of Church of the Cross is given to groups in the community doing good and godly work. Gifts have been made to Lake Travis Crisis Ministry; Mobile Loaves and Fishes; Partners in Hope; El Buen Samaritano; Austin Disaster Relief; Caritas; Partnerships for Children; and Helping Hands Crisis Ministry of Spicewood. We are grateful to support and come alongside the life-giving work of these community ministries. For more information on how you can be part of the ECC ministries of service in the community, please contact us at office@ecclt.org.